Adobe just updated the Creative Cloud. Let’s take a look at some of the features you should know about. As creative professionals we are always looking for ways to improve our efficiency. One way we do this is by leveraging the latest updates and features for the platforms we utilize to get the job done. Adobe is no stranger to updates and new features, and they routinely drop new releases throughout the year, and there always seems to be new releases close, or leading up to NAB. This year was no exception. With all of this said, we’re going to take a look at the latest updates and features for four of the most important Motion Design apps on the Creative Cloud. These platforms include After Effects, Premiere Pro, Photoshop and Illustrator. Let’s not waste anymore time and dive right in. We’ll get things started with After Effects since it’s our go-to software. Just in time for NAB, Adobe released a group of new features for the platform in early April. With this release we’re getting some advancements to the Puppet Tool, the addition of Master Properties, and improvements with regards to VR. When the Essential Graphic Panel came out a couple years ago it was absolutely a game changer for Motion Designers. Master Properties take the Essential Graphics Panel one step further. Master Properties allows you to adjust layer and effect properties inside a nested comp. This should definitely make things easier for all of us when we’re working on complex compositions that utilize pre-comps, because now we don’t have to open the nested comps in order to change properties. We made a tutorial on the new feature. Check it out and prepare to have your mind blown. The new and improved Advanced Puppet Tool allows for “new pin behavior and smoother, more customizable deformations, from ribbony to bendy.” After Effects will also dynamically redraw a mesh based on the placement of pins within the comp and retain the detail of your image regardless of the usage of multiple pins in an area. Essentially it should smooth out those jagged triangular edges and make for a more natural bend. With the immersive environment update you can now preview comps within a head-mount display for VR. As of now Adobe lists the HTC Vive, Windows Mixed Reality, and Oculus Rift as the hardware to utilize this feature. You’ll be able to preview between Monoscopic, Stereoscopic Top / Bottom, and Stereoscopic Side by Side. And the world is now one step closer to a Ready Player One future... Haptic suit here I come! These are just a few of the latest features for After Effects in the new release. For a full schedule of updates for AE be sure to check out the New Features Summary at Adobe Help. For those of us who utilize Premiere Pro to finalize our video projects, the newest release of the software gives us some great new features to make things work better for us. There are graphic enhancements, additions to the Program Monitor, color changes and more. Let’s hit the top three updates that caught our eye. In this new feature Adobe allows editors to split the Program Monitor so they can compare looks. So, you’ll be able to see the looks of two different clips side by side, or you can see a clip before and after effects (not the software) are applied. This will be a handy tool to add to the toolkit especially when getting to the point of color correction and grading. 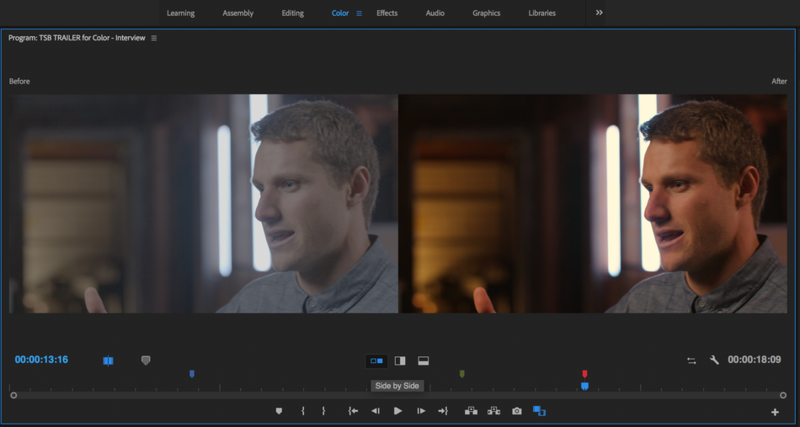 One area that Adobe has done a really good job of improving within Premiere has been the color correction and grading features. With the latest release we get a few new upgrades as well. Now we can automatically match the color and light of two shots within a sequence, or we can install custom LUTs and have them appear in the Lumetri Color panel, and we can also use the fx bypass option which toggles an entire effect on or off. Whenever you’re working on a project you almost always find some great music to complement your work. Then you’ll have sound effects or even dialogue added to the project as well. The new Auto Duck feature automatically adjusts the music volume to duck behind that dialogue or sound effect that is probably really important to the piece. This will go a long way toward helping those of us who aren’t seasoned vets in sound mixing, and in the end will make our work sound great. Adobe also added some great new features for the Essential Graphics Panel within Premiere. Now you can browse for Motion Graphics templates, create gradients for shapes, and toggle animation for graphics layers. For the full range of updates check out the New Feature Summary at Adobe Help. The January 2018 release saw a few new updates and features for Photoshop. We now have a dial option for usage with the Microsoft Surface and we also got a new feature called select subject. Let’s take a closer look at these new features. Those frustrating days of using the lasso or wand tool to seperate things out may be a thing of the past now that Adobe has released Select Subject. This new feature allows users to select the “most prominent object in an image,” such as a person within the composition with a single click. This could come in handy if you need to do a 2.5D parallax effect. For some designers the microsoft surface is a life saver as it allows you to dynamically create compositions using the touch screen function. With the new support for the Surface Dial users can now make tool adjustments with ease. Some of the options that you can adjust include brush flow, layer opacity, later size, and so on. This is a great new addition to Photoshop and should make working with the software on the Surface more intuitive. 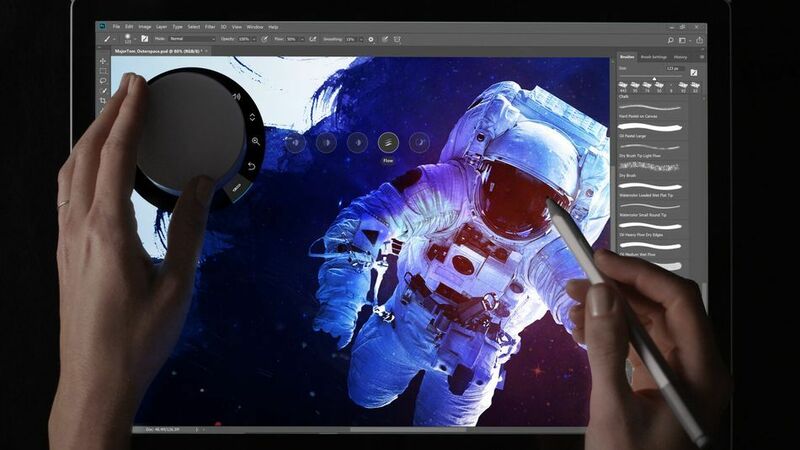 In another update between Microsoft and Adobe, Photoshop now offers users User Interface scaling. You can now scale the UI from 100% to 400%, but also automatically adjusts scaling to fit your Windows settings. Another interesting addition is multiple scale factors for different monitors. So, if your working on a laptop, but using a secondary monitor, you can choose one scale factor for the laptop screen and another scale factor for the second monitor. Back in October of 2017 Adobe pushed out another series of new features and updates for Photoshop. These included some amazing new additions to brush support such as stroke smoothing and new brush management tools. For a full list of new features check out the New Features Summary page at Adobe Help. Illustrator saw a few new features and updates hit just this past month and one fantastic new feature from the October update. Among these are multi-page PDF imports, adjusters to anchor points, and the new puppet warp tool. Let’s take a look at our favorite new features. If you’ve worked in graphic design at all then you’ll know the pains that you go through when working with a multi-page PDF in Illustrator. You could never work on more than one page within a single pane, at least until now. The multi-page PDF file feature will allow users to import a single PDF page, a range of pages, or all pages. This could be a game changer for graphic designers everywhere. Have you ever worked in Illustrator and thought that the anchor points, handles or boxes were just too small see, and you wish you could adjust them? Well, with this new feature you can simply head over to Illustrator’s Preferences menu and use a simple slider to adjust the size of your anchor points, handles, and boxes. Back in October 2017 release there was one feature that really had many of us excited and that the addition of the Puppet Warp Tool in Illustrator. This new feature works very similarly to the puppet tool in After Effects, and will warp and adjust your image with very little distortion. This could definitely come in handy for simple layer adjustments. This is far from the only updates to Illustrator from the October 2017, or the March 2018 releases. 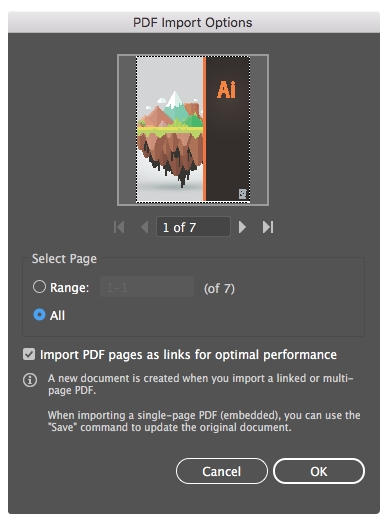 For a full list of new feature for Illustrator be sure to check out the New Features Summary page on the Adobe Help website. In addition to all of the updates listed here you can also vote on new features for the Creative Cloud. There you have it! Adobe has released some great new features to our favorite slate of programs. It always helps when you have the ability to expand your tool palette, and with some of these new feature we’ll be able to jump right into our next project and hopefully become even more efficient than we were before.